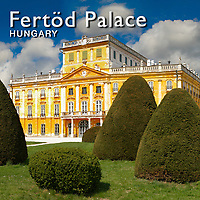 Fertod Hungary pictures, photos. Images of Fertod Eszterhazt chateaux to buy on line as stock photos or photo art prints. Fertod is a town located in the Gyor-Moson-Sopron county of Hungary, not far from Austria. Fertod was formed when the towns of Eszterháza and Süttör were unified, in 1950. It is the location of one of Hungary's best known palaces, Eszterháza, which was built in the 1760s by Prince Nikolaus Esterhazy.